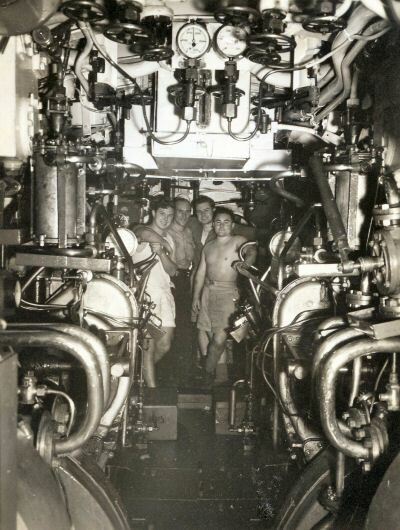 Paxman built all but four of the engines for World War 2 'U' Class submarines, including those installed in P46 which was later named HMS Unruffled. During Warship Week, 14th to 21st March 1942, the people of Colchester were charged with purchasing £250,000 worth of War Bonds to fund the building of P46. The town raised the much larger sum of £435,223. In December 1942 a plaque was presented to 'The Town of Colchester' by the Lords Commissioners of the Admiralty to commemorate the town's adoption of HMS Unruffled. On 29th December 1943 the crew of HMS Unruffled visited the Paxman works and subsequently attended a civic reception at Colchester Town Hall. 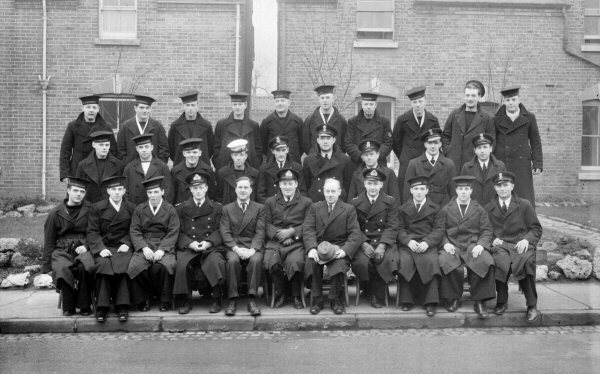 The photograph below, of the crew during their visit to Paxman, was taken in Standard Road, just outside what was the main entrance to Paxman's Standard Works. 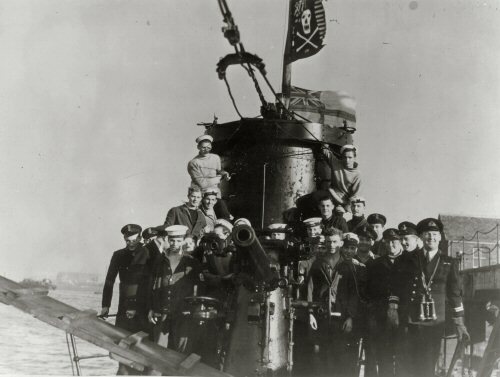 The crew of HMS Unruffled during their visit to Paxman on 29th December 1943. Fifth from left in the front row is Edward Paxman. Seventh from left is Percy (later Sir Percy) Sanders. The plaque presented to Colchester by the Admiralty in 1942, which originally hung on display in the Town Hall, was later taken down and 'lost' for many years. After being rediscovered relatively recently, it was re-installed in the Town Hall at a commemoration held there on 14th March 2012, the 70th anniversary of the start of Warship Week in 1942. HMS Unruffled, under the command of Lieut J S Stevens, served in the Mediterranean theatre of operations from the summer of 1942 until December 1943. She formed part of the 10th flotilla which fought the most concentrated submarine battle in history from the beleaguered island of Malta. shows just how cramped and confined conditions were in the engine room. She completed 19 war patrols and sank 10 enemy ships totalling 40,000 tons. She severely damaged the heavy Italian cruiser "Attilio Regolo", blowing off her bows with a torpedo strike, leaving her unable to participate further in the war. HMS Unruffled took part in the invasion of Sicily in July 1943 as a beacon marker for assault craft. On other occasions she was involved in undercover operations, including those against Cephalonia in August 1943, and transporting two-man chariot attacks. Lieut Stephens was awarded the DSO and DSC for these operations and survived the war. The supreme allied commander, General Eisenhower, described him after one attack as "The maddest captain in the navy". HMS Unruffled's crew suffered no combat fatalities during the war. Lieut Stevens died in 1992. Above: The crew gathered around the gun platform of HMS Unruffled while in Valetta Harbour, Malta. Extreme right is Lt J S Stevens DSO, DSC (Commanding Officer), behind him is Lt O Lascelles MBE, DSO. Behind Lt Lascelles is Lt Lercott and behind him is PO Coxwain Alfie Thomas. Gunlayer Sandy Powell is 11th from right. Built by: Vickers Armstrong, Barrow-in-Furness. Propulsion: Diesel-Electric. Two 6-cylinder diesels built by Paxman at Colchester. Scrapped: January 1946 at Troon, Scotland. Acknowledgement: My thanks to Mr Robin Webb of RWCL, a Colchester-based consultancy, for providing most of the information on this page. Mr Webb is Chairman of the Royal Navy Submarine Museum Development Committee and played a prominent role in efforts to have the HMS Unruffled plaque re-installed in Colchester Town Hall.